The Kramer PA-50HZ is a compact power amplifier offering 50W of Class-D amplification for 70 or 100V constant-voltage systems in small- to medium-sized spaces such as conference rooms, classrooms, restaurants, and retail stores. Its aluminum enclosure occupies just 1/4 RU of rack space, and incorporates convection cooling for effective temperature regulation. Wire a stereo source from a mixer or matrix switcher to the balanced 5-pin terminal block input then utilize the 3-pin terminal block for connection to mono high-impedance speakers. 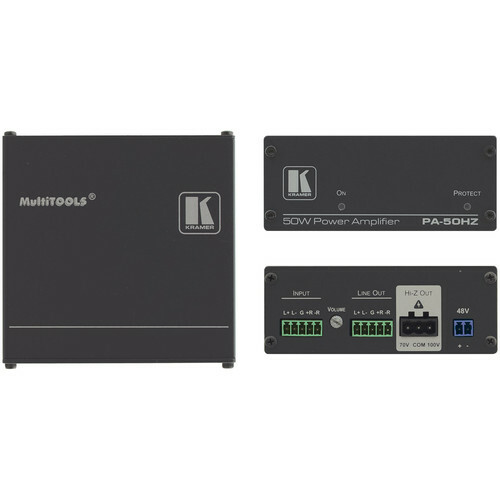 A dedicated 5-pin terminal block output allows routing of the PA-50HZ's balanced stereo line-level output to a recording device or another PA-50HZ amp. The rear panel features an input level attenuator, while the front panel presents dedicated LEDs for indication of power and protection status. The PA-50HZ is powered via the supplied power adapter and power cable.